When you think of the Mediterranean, probably the first things that cross your mind are – olives. Perhaps you will also think of Greece, but do you know where some of the oldest and biggest olive gardens in Europe are? Well, have you heard about a little place called Lun, Croatia? It sits quietly on the northern side of the island of Pag, 18 kilometers north of Novalja. While Pag may be famous as a summer party destination and its sandy beaches (at least everybody’s heard of Zrće, right? ), one can easily just stray away from it all and take a relaxing stroll through the wonderful olive gardens in Lun. The feeling is therapeutic and fulfilling at the same time. Before we start with Lun, let’s just briefly remind ourselves of what olives mean for the Western civilization. These mythical plants have symbolized many things throughout history: peace, life, strength, eternity, wisdom. Centuries old myths include olives as leitmotifs. 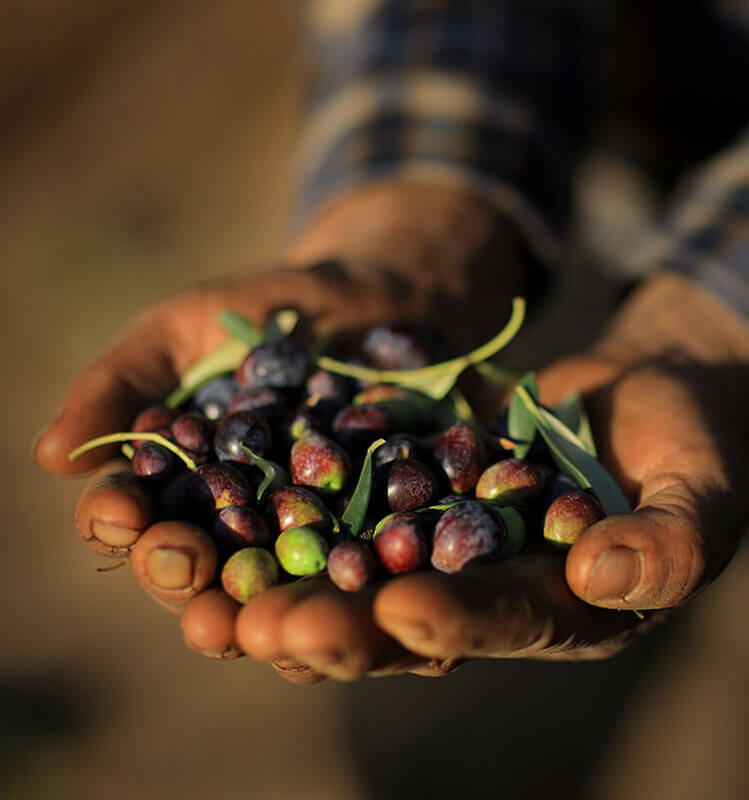 In ancient Egypt and Greece, olives and their oil were used to anoint and reward heroes and important figures. In Christianity, the olive branch was brought to Noah by a dove after the big flood, which is why today it symbolizes peace that God brought upon the people. Lun’s olive gardens are preserved since 1963, and the locals built roads that lead through the site. 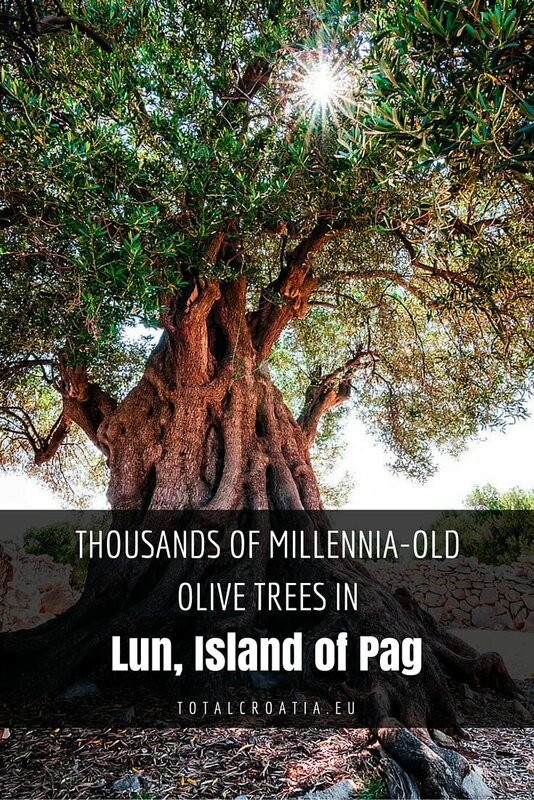 The numbers are staggering: more than 80 000 wild olive trees (!) are spread through the area of about 24 hectares. For all you Latin name-geeks, it’s Olea aleaster linea. The trees burst through the rugged rocky landscape, and strive in spite of the harsh cold winds, which Croats call bura. It’s certainly not something to mess with, just ask the locals! But hey, it’s like they say – „sticks and stones may break my bones…“. These hard conditions are exactly what give the olive trees their shape and character. What’s more, imagine enduring such strong rushes of wind through a period of thousand years, because some of these trees are that old! There are only two more olive gardens in the whole world which are similar to this unique place – in Greece and Israel. But Lun has the most millennial trees gathered in one spot. Around 3,500 people walk through these gardens in the summer season, mostly party animals coming from Novalja seeking refuge after their sleepless nights. There’s plenty of shade to be found underneath these divine old trees, where you can enjoy the soothing sound of splashing waves in the distance. Oh yes, while walking around, don’t be alarmed at the sounds of bleating, as those are only produced by passing sheep. Locals have built special type of walls to guide their sheep and ensure they don’t get lost – the stone slabs piled over one another are called ozuba, and they’re specifically built so the brainy sheep wouldn’t try to jump over them. Also worth mentioning is that Pag’s cheese made from local sheep milk is a world famous delicacy (but of course, you already knew that). There are small electric vehicles providing transport for those unwilling to walk. Of course, you can buy souvenirs like olive oil to put in your salad, or other olive-based products. You can reach Pag by ferry, or cross the Pag Bridge on the south. It’s roughly a 20-minute drive from Novalja. Take a break, come to Lun and marvel at this breathtaking and enchanting place full of history!